Nicolas Bernardy, Head of our Commercial and Corporate Team and Leader of our Restructuring and Reorganization Task Force, has been appointed as Chief Editor of the legal journal “Jurisnews – Insolvency proceedings” published by Larcier. 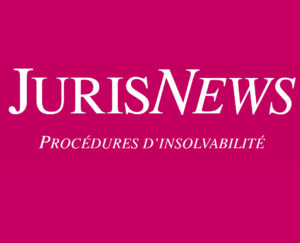 “JurisNews Insolvency Proceedings” analyses and comments on the most relevant case law decisions and legislative developments in insolvency law and credit guarantees. It offers a fresh look at recent case law developments in bankruptcy (commercial and personal) and restructuring. Nicolas Bernardy says: “This new position is an acknowledgement of our expertise in this field of law. “Jurisnews Restructuring and Reorganization” is the only legal journal focusing on these topics in our jurisdiction and it has clearly become an authority in this evolving area of Luxembourg law”. 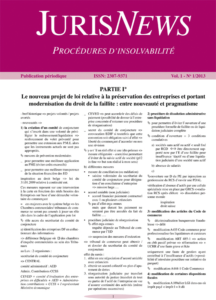 This first edition for 2018 deals with the principle of equality of creditors in collective proceedings as well as the legal and contractual mechanisms set up by Luxembourg law or practice that make it possible to limit or derogate from this principle.